28 Jan NUTS FOR DEER !!! White Oak acorns are like Hershey Kisses for deer. The abundance of acorns attract deer from miles around. A Nut, or “mast” crop is a fall event that comes just in time to support deer heading into winter. Acorns are a wonderful winter food for deer and other wildlife. Other forest foods like apples, persimmons, and other fruit trees provide additional food. Grasses, forbs, tubers, and domestic crops fill out the deer buffet. Hunter planted food plots are also common ways to attract deer. One of my Old Reliable tree stands was next to an ancient White Oak tree. There were no other acorn producing White Oaks anywhere on the property where I hunted. When fall would arrive, it would rain acorns. The deer would soon follow. I could hunt that stand into winter due to the abundance of acorns that the deer would scratch up. In the spring, turkeys would show up. I could also scratch up acorns all year by simply rustling through the leaves. Many deer were tagged from this Old Reliable stand. Ironically, White Oak Acorns are not considered the best nuts for wildlife. 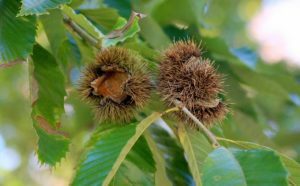 Chestnut trees produce a better-quality nut that are not as bitter, 40% carbohydrates, and 10% protein. They also begin producing annual nut harvests within a few seasons. Oak trees take decades to produce acorns that vary in yield with seasonal conditions. Our natural forests were not always stocked with Oak trees. 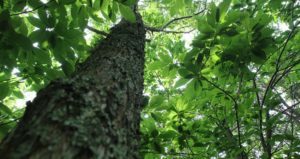 The American Chestnuts were the primary hardwood of our forests. Over a century has passed since a blight nearly wiped out our native American Chestnut forests. Oak, poplars, pines, and other trees filled the void. If deer had a choice, they would target Chestnuts over all other forest mast crops. Fortunately, foresters have managed to cross naturally resistant American Chestnuts with a Chinese Chestnut. The hybrid tree is a stronger, blight resistant version known as the Dunstan Chestnut. It is named after the tree breeder, from North Carolina, that created this wonderful replacement. The BEST TREE to PLANT in your deer forest may be this new Chestnut tree. Chestnut Trees, like all forests are a lifetime labor of love. Once established, they become the gift that keeps on giving. Chestnut trees begin producing nuts within 3 years and can drop 10-20 pounds of nuts by age 10. Chestnut trees can live nearly a century or more. Annual nut crops are normal with some years of major harvests. Yield only improves with maturity. Chestnuts also have a spiked protective husk that allows them to survive for long periods of time. Not only will Chestnut trees enhance your deer hunting, it will add value to the renewable forest products. The Chestnut wood value as firewood, lumber, or timber are exceptional. Other deer food plots require reseeding, plowing, planting, and annual efforts. Chestnut trees will be a long-term solution to your deer forest. Islands of Chestnut trees in your forest will draw deer from miles away. Check the local Forestry office to make sure that your area has potential to grow Chestnut trees. A tested soil pH of 6-7 is best. Adding fertilizers can adjust the soil pH if needed. This takes several weeks. Get the pH right before planting. Additional fertilizer may also be needed. Water is critical, and some initial protection may be required. Examine your property, with a Forester, to find where the Chestnut trees will have the best light, nutrient, and water conditions. This is where you want your long-term deer magnet to be rooted. The best time for planting is spring or early fall. Trees are available from local Forestry tree farms, nurseries, catalogs, and greenhouses. If the Forester helps you develop a forest management plan, trees are often free as part of the approved forest plan. There may also be volunteers available to help you plant your new deer forest. Tree planting means digging a hole that is twice as wide as the root ball and so the root ball is just at the surface. Many prime locations are full of rocks so tool up accordingly. Place some weed barrier around the tree to limit weed competition. Use the rocks to hold the fabric in place and protect the tree base. You can also add some moisture absorbing gel crystals, or vermiculite to hold water on the roots. Protect the young trees with a support stake and a wire cage. Biodegradable tree tubes will also help. Other critters enjoy rubbing, chewing, and messing with young trees. It helps to add water initially to sustain the new trees. Once established, their roots will find a path to moisture. Consider areas in your forest with natural drainages, wetlands, and springs. If the goal is to create a permanent deer hunting zone, plant your Chestnuts near a bedding area. If there is not a bedding area, also create one using pine trees, hinged trees, and blowdowns. Consider the natural paths to and from a feeding and bedding area and establish your living deer ambush site. Keep your trees spaced so that appropriate sunlight will be available. You may need to thin the forest of other trees to allow your new Chestnuts to thrive. Now you simply need to harvest the deer, and products that your new valuable resource has created. Keep a log about the number of deer sightings and history of the forest. Create paths to and from the area that you and the deer will use. You will not only enhance your forest but will help to restore our forests with what was once the dominant tree.